George Lee of RTÉ Radio 1 show “The Business” was down at the National Maritime College of Ireland this week to record a maritime based segment. The show will feature Conor Mowlds, Managing Director SEFtec NMCI Offshore, Val Cummins, Director of MERC3 and Tom Griffin, Head of Offshore Survival Training at SEFtec NMCI Offshore. 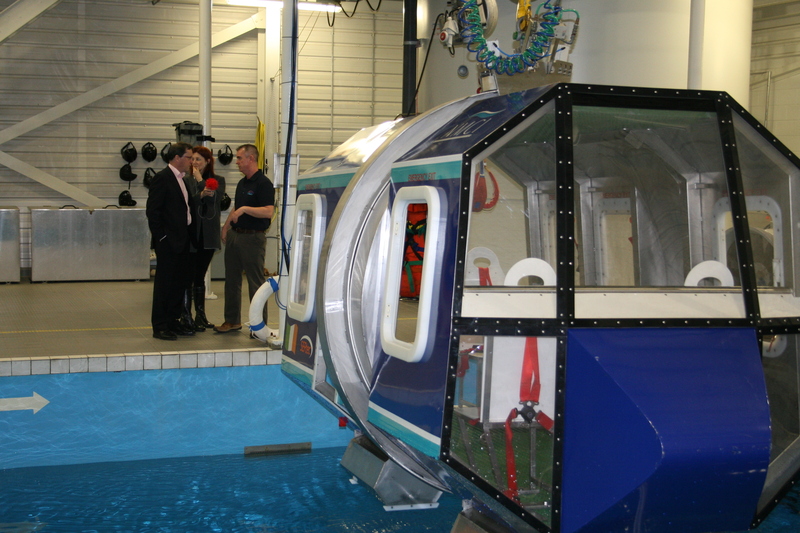 During the course of the interview Mr. Lee was in a helicopter simulator and he was briefed on all the safety procedures you need to know in the unlikely event of a helicopter crash. 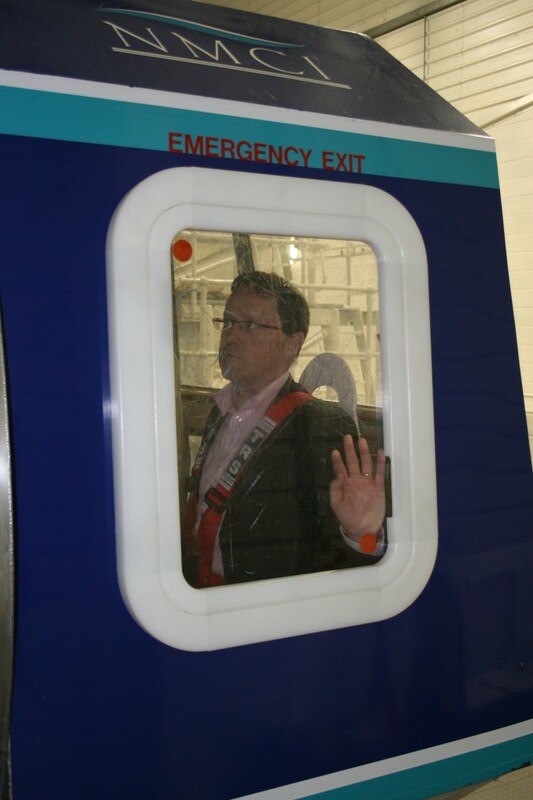 George was also put in control of a liquid cargo vessel in our 360° Kongsberg simulator. Conor Mowlds spoke of the vital OPITO offshore training that NMCI Services is giving both home and abroad. 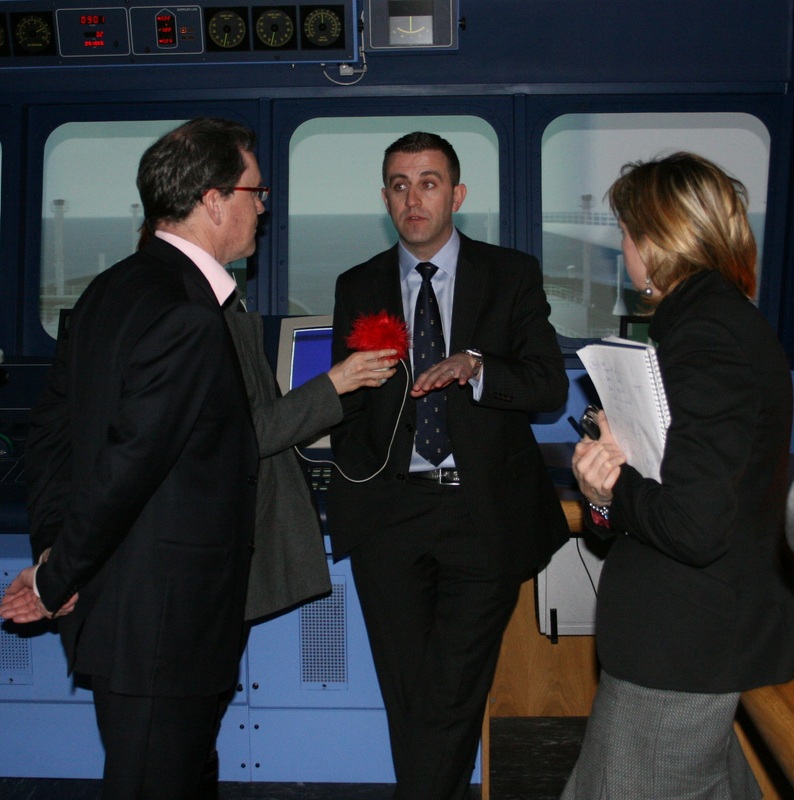 In 2011 alone the college is on target to train over 500 people for the offshore oil & gas sectors. Mr. Mowlds spoke of a number of joint ventures that the commercial division of the college has fostered such as SEFtec NMCI Offshore (SNO) & GAC Training & Service Solutions (GTSS) which mean that the NMCI can not only equip people to search safely for oil and gas in the harshest environments on the planet, but to trade the commodities as well. Ms. Cummins briefed George on her work with MERC3. MERC3 brings University College Cork (UCC), Cork Institute of Technology (CIT) and the Irish Naval Service (INS) together, for the first time in a unique tripartite relationship, with the mission of providing an integrated, high value, critical mass for the development of the Maritime and Energy sectors. The show airs on RTÉ Radio 1 at 10am this Saturday and the podcast will be made available here in due course. Sum of 3 + 8 ?